Making dumplings/ boiling water: 30 min. Cook: 12 min. 3min. on each side. Total: 1 hr. 42 min. I made your fruit dumpling recipe. I didn’t cook long enough so they came out undercooked. I will try again. The dumplings were almost like my grandmother’s recipe. So happy to have found these video’s. Next I will try the dumplings. Thanks again. oh I so hope these turn out…they look like my Grandma’s ..she used plums and peaches..I love your site. Thank you for bringing me a like of my heritage. in your fruit dumpling recipe can you substitute plain flour for wondra flour? and is the yeast measurement in your recipe (3 tsp) for fresh or dry yeast. Caroline, I don’t think the regular flour would work. 🙁 I have never tried it though. It is dry yeast. For all my recipes I am using dry yeast. Dear Pavel, your comment made me very happy. This is the heartbeat of Czech Cookbook. To bring our heritage and culture back to life for any Czechs who live here in the US. I hope these recipes are a blessing to you and your family! Hello! I am trying to learn to cook for a Czech friend of mine, do you think I would be able to make the dough the night before and then make the dumplings the next day? 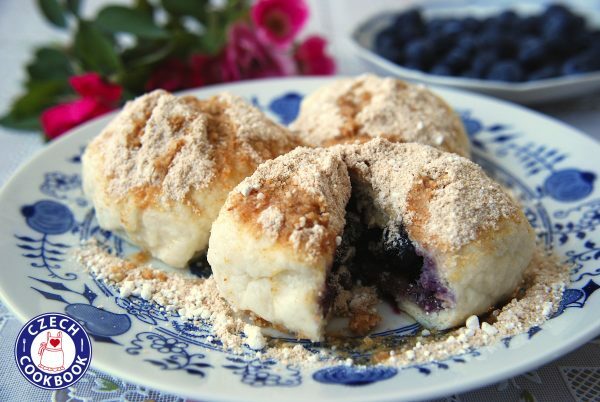 Do you have a recipe for fruit dumplings using farmer or cottage cheese in the dough? Also farina but no yeast. Thank you. I like your video very much. Hello! My grandparents were from Czech Republic, aka…Czechoslovakia (their specific name to them), and we were taught to use the dry cottage cheese and semolina too! I wish I could find the recipe. I can look further, as my mother’s and granmother’s recipes were taken in a flood! thank you for all your good work! My mom has recipe passed down that uses Ferina as well! I wonder if this was some sort of substitute made after coming to the USA? Mom also uses peaches. I am not sure. I have never tried Ferina. Peaches sounds yummy! My mom and I made these for my food fair project at school! They turned out very slimy and tasted weird. Not sure if we did something wrong, we followed step by step and used all the correct ingredients. We ended up putting the ones we hadn’t put in the water in the oven and they turned out pretty good. Maybe we did something wrong maybe you could have an idea what we did wrong! Thanks. PS your video was still very helpful so thanks! Jako kazdy cech zijici tady v USA tak taky me chybi ceska kuchyne, Udelal jsem si podle tebe Kynute se svestkama s Wondrou flour. vysly fantasticky . Pustim se taky do “smazaku” ale myslim si, ze ten nejlepsi delaji v ceskych pohostinstvich. Ale i tak jej zkusim. Jsem moravak jako ty, pochazim ze Zlina a Brno jsem jako kluk navstivil mnohokrat s hokejem na stadion Za Luzankami. Ja jsem ze Seattlu a jsem zde jiz od 1990. Ahoj Libore, zdravím Moravaka. Jsem rada, ze se knedle provedly. Tak ať chutná i smazak. I would like to make these in advance to take to a friend’s house for the weekend, What do you think? 1) Can I make the dumplings, refrigerate them and then cook them at the friend’s house? How long can they be kept refrigerated–one day; two days? 2) Should I cook them at my home, then refrigerate them and then re-heat them at friend’s house? Can I make them one day and heat them the next? 3) Should I just make the dough, refrigerate it, and then assemble them at friend’s house and cook them? Again, how long can I keep the dough refrigerated? I want to avoid making them from scratch at our friend’s house because we will be out doing things–need a short-cut. We had these in Český Krumlov—yum!!! I would make them ahead in your house and keep them refrigerated. Two days ahead should work. Cook them and keep them covered so they don’t dry up. In friend’s house I would steam them. They also freeze well if you want to keep them longer. Good luck! Ja jsem rad ze jsem objevil czechcookbook.ja jsem uz pouzil nekolik vasich receptu a vzdy to vyslo perfect.Dekuji za vase recepty. What is wonder flour ???? Wondra flour is more course than regular flour. These look just like what my babička makes! Thank you so much! In Canada you are looking for these: Robin Hood Nutri Flour Blend “Tastes Like White” or Robin Hood Easy Blend. Wondra is only in USA.